LG recently unveiled its latest flagship smartphone, the G2. The dedicated launch event brought the ultra-slim bezel, the new design and a few other cool new features into the limelight, but there was no information on the availability and the pricing of the smartphone. However, an online listing revealed the cost of the device in Europe. Now, the latest beast from the house of LG is up for pre-order in the UK and the first stocks of the smartphone are expected to hit the stores by "late September". Clove and Expansys are currently taking the pre-orders for the LG G2 smartphone. The first store has priced the device at £468 (including VAT), while the latter is yet to confirm its asking price. Clove, too, mentions that pricing and availability are subject to change, but they seem pretty reasonable so there's a good chance they are correct. 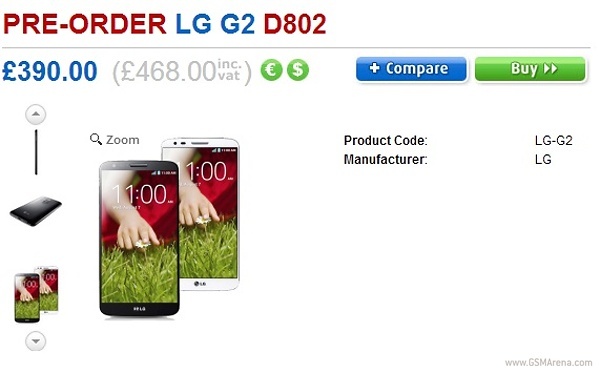 The LG G2, which will be available in Black and White color options, and can be pre-ordered from the two source links below. If MicroSD slot is so matter... why don't you just get a Korean version then. It'll work flawlessly anywhere in the world. I planned to get one myself. It is a beautiful instrument! Worth it having these physical buttons on the back. So I'll wait for the next Nexus 5. And I hope you do not get these buttons! Please Google, do not place these buttons on the nexus 5.